Keep your wedding planner with you – plan at any moment and, at any location. 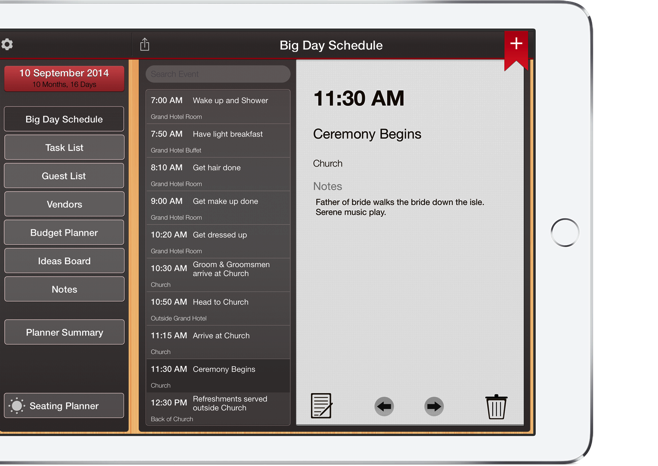 Wedding Planner Professional can sync its data with its Mac counterpart. Effortless way to add +1 to each guest profile – gender selectable! Handy when you don’t have the details but know that they are bringing someone to your wedding! Able to set levels of task priority – low, medium and high. Add unlimited photos to help you remember what made you like this particular vendor! Able to categorise the vendor e.g. reception, ceremony, photographer, etc. Able to enlarge the photos to show your family and friends which vendors you prefer and let them help you make a decision. Automatically calculates your total estimated budget, actual cost, total paid and how much is left owed. Tracks partial payments and payment history – with flexible note entering. Create your seating plan and easily assign guests to each table. Quickly and easily provide a label/title name for each of the objects on the workspace Note: It will even detect whether the ‘Other’ object you’ve added is a “Dance Floor” – try typing it to see what happens! Extremely neat. Automatically adds guests and their respective +1s to the table. Note: As the guest and their +1’s should always be seated together, if you remove one or add one to the table, they both will always be paired together. Easily see the gender seating arrangement and which tables require special dietary needs! Provides an overview to quickly see where the seated guests are! Allows you to seat the bride and groom and keeps track where if they have been seated or not. Export the seating planner list – extremely useful for wedding reception venues! Note: The Bride and Groom are included in the total adult count when exporting the seating list! Provides suggestions of who to seat next to the guest – uses the accompanying guest list feature! How convenient! Don’t need to wait for RSVP to come through to work on your seating plans! A neat feature we’ve implemented is that if the already seated guests and their +1s decide to RSVP as not attending – you will be able to easily and quickly see where they are currently seated on the workspace! Keep track of your ideas in one place, inspire yourself by creating themed boards. Keeps track of all your wedding ideas in one place! Add photos and make notes of wedding ideas you come across that you would like for your BIG DAY! Create different idea boards for different aspects of your wedding! Rename and add a title for each board, e.g. hair ideas, cake ideas, table centrepiece ideas, etc. Boards are automatically sorted alphabetically – makes finding them easier and quicker! Informs you which task time frame you should be at using your wedding date – don’t have one yet, give an estimate!